What TV latency is acceptable to avoid social media spoilers? With many high-value live TV events now being watched online, the additional delays introduced by an IP delivery system can have a significant impact on the viewing experience, particularly for live sports. If latency is too high, compared to satellite, terrestrial or cable delivery, then viewers are exposed to social media posts, texts and on-line commentaries that can contain spoilers for their game. Learning of a goal scored in the soccer match before you’ve seen the free-kick awarded is no way to experience content which is often acquired at huge expense by the broadcaster. What are the causes of delays in the TV delivery system? How can we eliminate these delays? 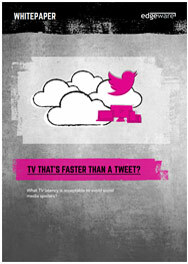 What is ‘the speed of a tweet’?